Two of the better things in life are spaghetti and pie. 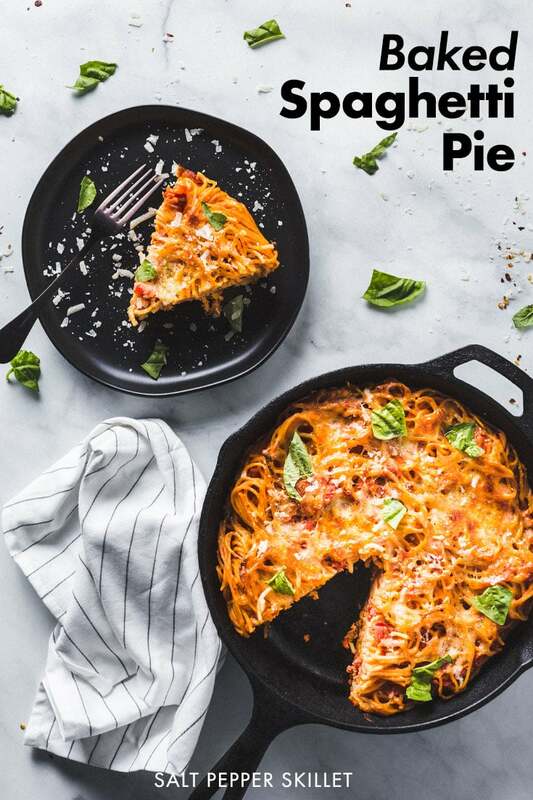 So what happens when you remove the “and” and just make spaghetti pie? This is what happens, and it’s glamorous. This post was created in partnership with Muir Glen and The Feed Feed. All thoughts and opinions are always my own. It all started as an accident. Leftover spaghetti. What to do with it? Well, it’s pretty obvious. Just heat it up in the microwave the next day and eat it, right? Well, yeah but it can transform into something so much more. Something crunchy, crispy, and something that is more like the main attraction rather than a leftover. 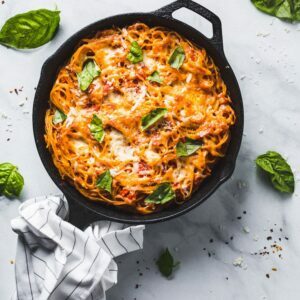 Do you know who else loves baked spaghetti pie? Kids! Yep, they love it. Our little 2-year will eat it for days and it’s easier for them to eat than regular spaghetti because the noodles are stuck together. 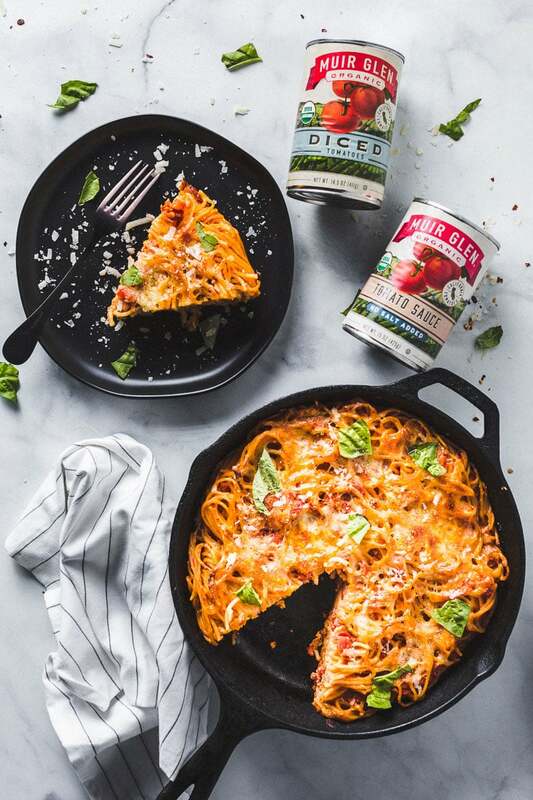 This spaghetti pie uses Muir Glen Organic Tomato Sauce, Muir Glen Organic Diced Tomatoes, garlic, ricotta cheese, mozzarella cheese, parmesan cheese, eggs, spaghetti, fresh basil, kosher salt and crushed red pepper flakes. 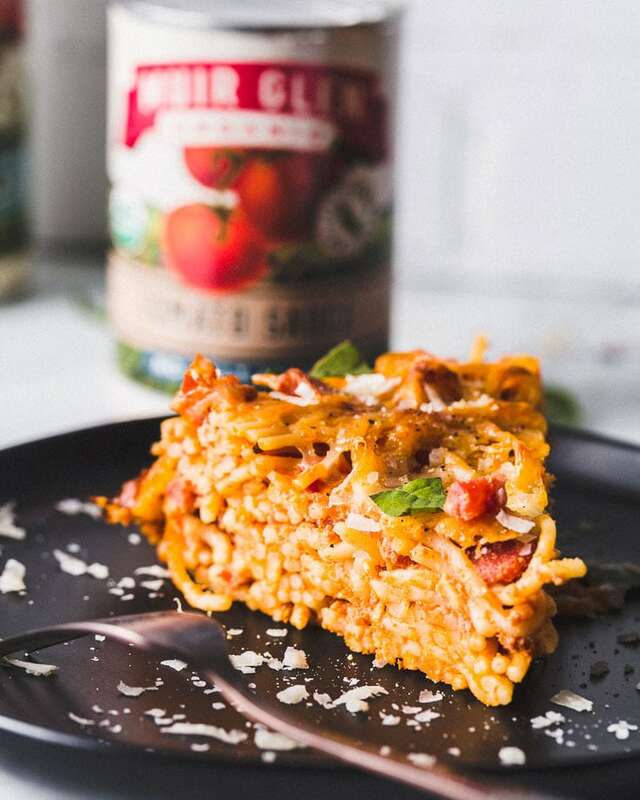 Baked spaghetti pie is a really simple dish that is basically a combination of a sauce with cooked spaghetti that is baked in the oven. It all starts with a few high-quality ingredients to make a quick marinara sauce out of canned tomato sauce and canned diced tomatoes. Pre-made marinara can also be used. The quick marinara is then mixed together with ricotta cheese, grated parmesan and eggs. 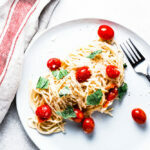 The sauce is combined with cooked spaghetti and is topped with mozzarella cheese and baked in a 400-degree oven for about 30 minutes until the top is golden brown. 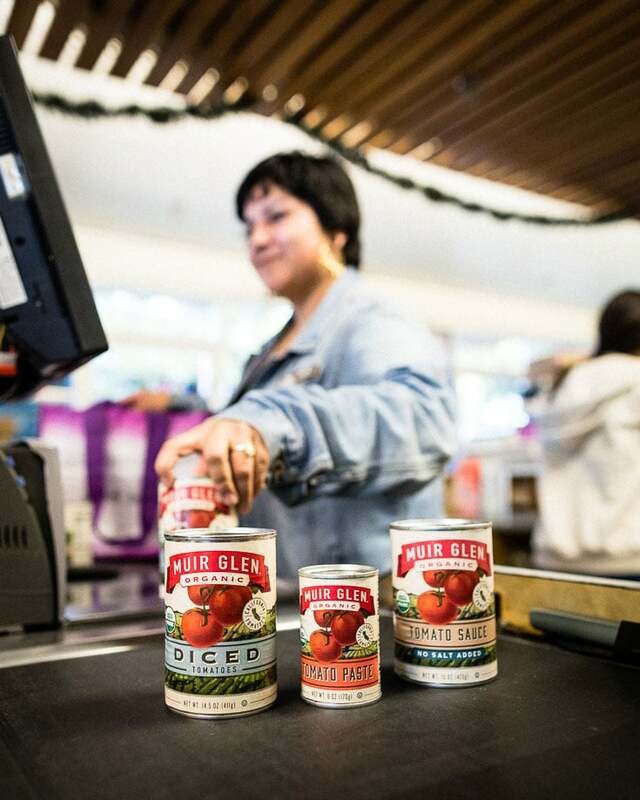 Muir Glen is a line of delicious all organic tomato products that are grown in the heart of California in the Sacramento Valley. They have a broad line of canned tomatoes, pasta sauces and salsas. Being a zero waste company; their tomatoes literally feed tomatoes. Tomatoes that don’t make the cut for the can, are transformed into rich, organic compost which goes back to feeding the next crop of tomatoes. For me, it really comes down to the flavor. Muir Glen products really do taste amazing, and I love that they are local to California, which is important to me. Tomatoes shouldn’t be traveling halfway around the world to get to our dinner plates. Not only are they a premium tomato, but they are accessible to almost anyone and are a great value on the shelf of your grocery store. 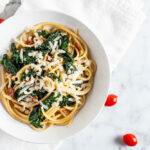 For this recipe, I shopped at our local Co-op, the Ocean Beach People’s Organic Food Market. It’s a local feeling grocery store where all products are organic and the customers are the owners. Anyone can become an owner and get owner prices. 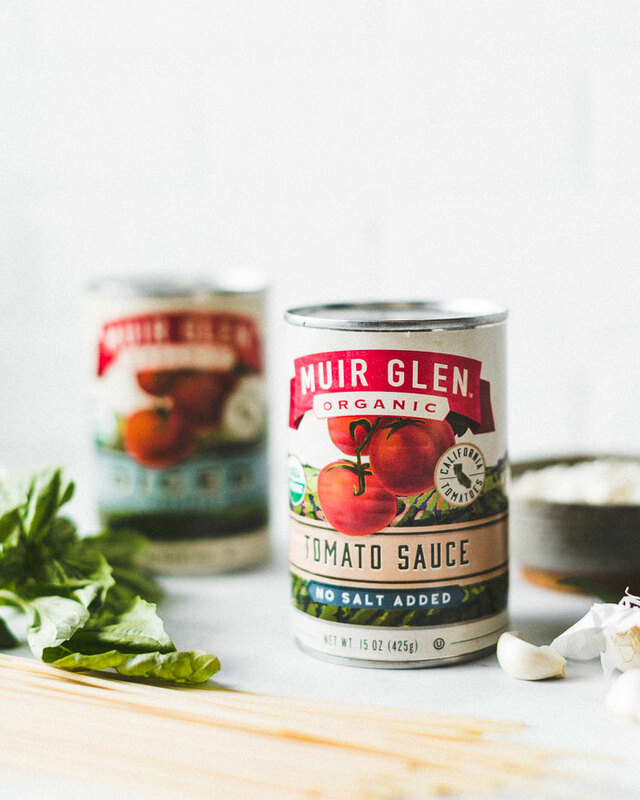 January and February will be a great time to stock up on Muir Glen products at your local co-op with a promotion for 10 for $10 – 14.5oz Tomatoes and February 2 for $4 on the 28oz cans of Tomatoes. Find the co-op market closest to you. The OB People’s Market is nestled in the sometimes quiet little surf town of Ocean Beach, California. The People’s Market is filled with locals who really care about what they eat, where their food comes from and a staff that’s there to answer all your questions and are always smiling. The flavors for spaghetti pie all start with the sauce, and this is a great one that takes just 20 minutes. I love to use a combo of the Muir Glen canned tomato sauce and the diced tomatoes. This makes for a great sauce consistency while still giving some chunky texture. It really is quick. Just sauté some thinly sliced garlic in some olive oil, add the tomato sauce and diced tomatoes, some herbs and seasonings then let it simmer for 15 minutes. That’s it. Heat a large skillet with 2 tablespoons of olive oil. Add the sliced garlic and cook for 1 minute. Add both cans of tomatoes, herbs, salt and red pepper flakes. Simmer for 15 minutes and cool slightly before using. Cook the pasta very al dente so it can absorb sauce and flavors. While the pasta cooks, whisk the eggs, ricotta cheese and 1/2 cup of the parmesan cheese in large bowl. 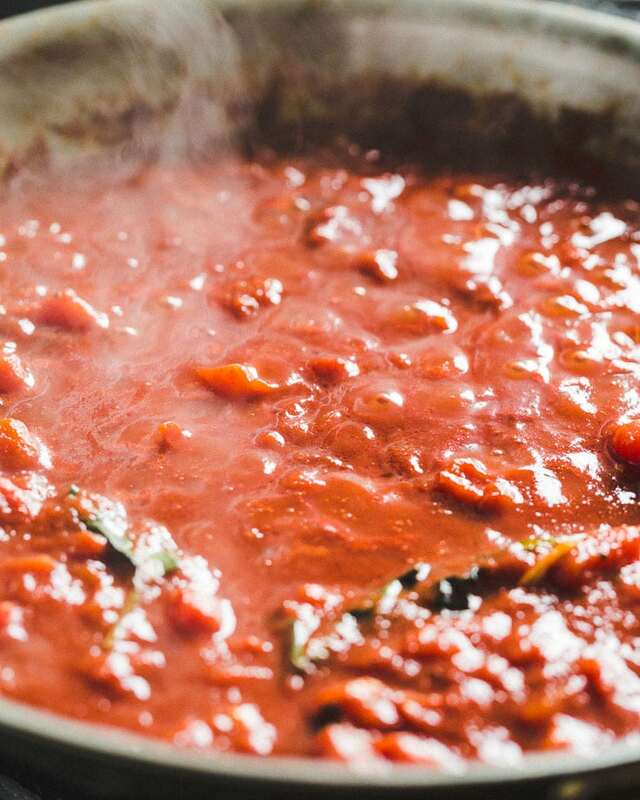 Gradually whisk in the marinara sauce to not raise the temperature too quickly, then season with salt & pepper. Add the cooked noodles and mix well. 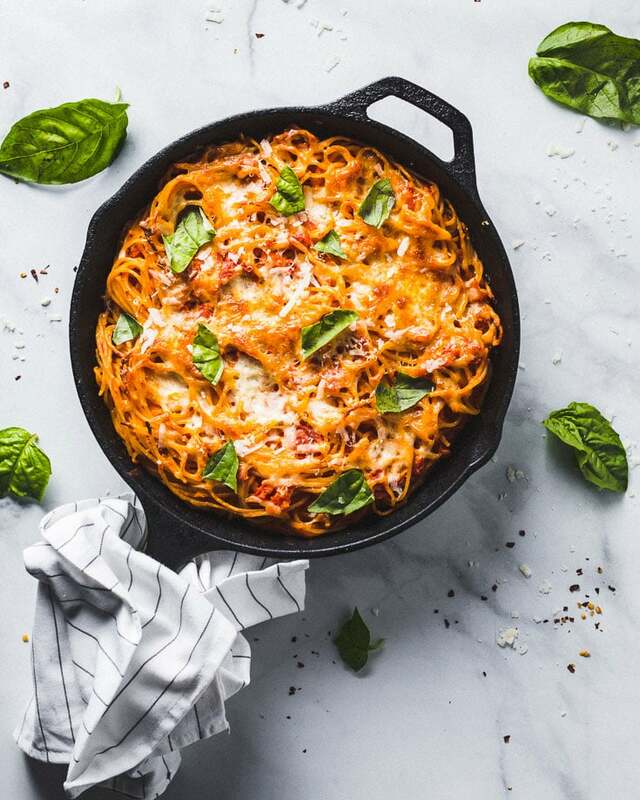 Transfer the spaghetti to an oiled 10″ skillet or pie dish and top with the mozzarella and remaining parmesan. Bake for 30 to 40 minutes, or until the top is golden brown. Cool for a few minutes before slicing into wedges and serving topped with freshly torn basil. The quick marinara sauce makes a little extra. Save it for serving on top of the spaghetti pie or for dipping bread. 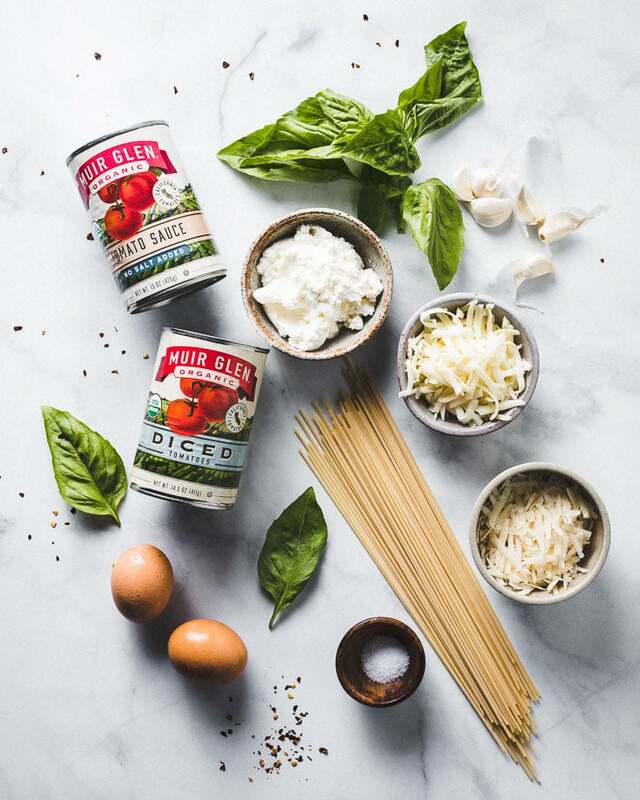 Muir Glen Classic Marinara sauce can be used instead of making your own quick marinara sauce. Thanks to Muir Glen and The Feed Feed for sponsoring this recipe, which helps to support this site. 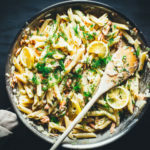 A super easy salmon pasta recipe with delicious flavors and a creamy texture.